Vanda Coatings have been electrostatically spraying shop fronts throughout the UK for over ten years. Our mobile sprayers attend sites outside of normal working hours to minimise disruption to our clients. There are many benefits of electrostatic painting over conventional spraying including an improved transfer rate which reduces overspray and results in a superior appearance. 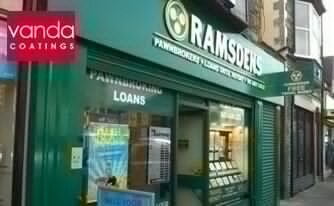 Electrostatic spraying was used at various Ramsdens stores throughout the UK to re-coat their shop front and shutters.